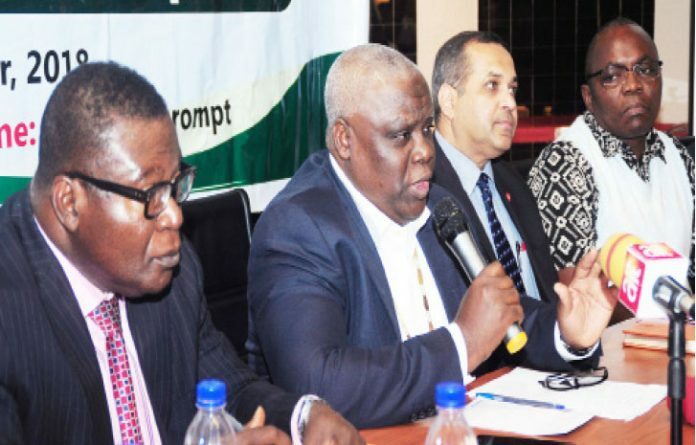 L-R: Emeka C. Duru, National Secretary; Ahmed Yakasai, Pharmaceutical Society of Nigeria (PSN) President; Bhushan Akshikar, Managing Director, Glaxosmithkline Nigeria, and Prof Martins Emeje, Chairman, National Institute for Pharmaceutical Research and Development (NIPRD) at the briefing on the 2018 World Pharmacists Day in Lagos, recently. To guarantee better health outcomes for patients in the country, pharmacists have called on the Federal Government to implement the approved Consultancy cadre for practitioners in the country’s hospitals. Making the call was Pharm. Ahmed Yakasai, the President of Pharmaceutical Society of Nigeria (PSN) who frowned at the delay over the implementation noted that that the Head of Service of the Federation has been foot dragging on the issue. Pharm. Yakasai who spoke during the celebration of this year’s World Pharmacists Day further reasoned that executing the approved Consultancy Cadre will give room for their recognition as medicine experts. The PSN boss further said that the theme of this year’s World Pharmacists Day, ‘Pharmacists: Your Medicines Experts,’ is in line with the PSN call for recognition as experts. He noted that PSN for decades have been calling for recognition of pharmacists in Nigeria as medicine experts and as consultants in the nation’s hospitals, insisting that the approval will help ensure better health outcomes for patients. Pharm. Yakasai, however, lamented that the Head of Service of the Federation has been foot dragging on the issue. He also observed that the Nigerian nation needs optimum medicine management, which is only possible if Nigerian pharmacists are given the opportunity to practice to their full scope of practice. This, the PSN president said, means allowing pharmacists to have the opportunity to improve the outcomes of medicine management in the Nigerian healthcare system. Pharm. Yakasai further explained that this entails rewarding pharmacists in the country for their significant expertise, skills and training and having a framework that allows them to have career development and recognition. The PSN President stressed; “We must ensure that the pharmacists are supported professionally by the government to be the best healthcare practitioners they can be. “They must be recognised as medicines experts; they should be rewarded for their significant expertise, skills and training and we must have a framework that allows for career development and recognition. He also identified poverty as the number one cause of disagreement among healthcare professionals in the country, especially in the discharge of their duties. According to him, healthcare practitioners need to collaborate in performing their duties regardless of the area of specialisation. Rivalry between healthcare practitioners, he insisted, is detrimental to the health of patients. Pharm. Yakasai also appealed to the Federal Government to reconstitute the council of Pharmacists Council of Nigeria (PCN), Nigerian Medical and Council of Nigeria (MDCN) and National Institute of pharmaceutical Research and Development (NIPRD) without further delay. The PSN boss while faulting the Yayale report, urged the Federal Government to disregard it, saying that it is one-sided and generate further crisis in the sector. He said; “The Pharmaceutical Society of Nigeria as a matured and peaceful professional organ wishes to use this opportunity to appeal to the Federal Government to reconstitute the council of Pharmacists Council of Nigeria (PCN), Nigerian Medical and Council of Nigeria (MDCN) and National Institute of pharmaceutical Research and Development (NIPRD) without further delay. Pharm. Yakasai called for a prescription policy and effective implementation, saying that this will enable every healthcare practitioner practice ethically, remove unhealthy rivalry and promote specialisation. He reiterated pharmacists’ commitment to the advancement of the health sector for the benefit of all Nigerians. He however tasked the government to provide the enabling environment for pharmacists to contribute effectively and efficiently to the healthcare delivery system in the country as medicine experts. Similarly, Pharm. Duru Emeka, National Secretary, PSN stated that all over the world, pharmacists now contribute to healthcare delivery by applying their different skills acquired during training and work place experience. In a separate report, Dr Francis Adedayo Faduyile, President of the Nigerian Medical Association, and all members of NMA congratulated Pharm. Yakasai and every pharmacists in Nigeria and across the world on the special occasion of the World Pharmacists Day. The NMA President says the theme for this year’s celebration: “Pharmacists: your medicines experts” is a reflection of the important and key role played by Pharmacists within the healthcare team globally. “We also wish to reiterate our commitment to maintain the already established cordiality and collaboration with your members, ensuring harmony within the health sector for the benefit of the patients,” Dr Faduyile added. The International Pharmaceutical Federation, FIP, had in 2009 designated 25 September to mark the annual World Pharmacists Day. Dr Carmen Peña, the Immediate past President of International Pharmaceutical Federation (FIP) observes, “World Pharmacists Day 2018 will focus on the extensive expertise that pharmacists have and put to use every day to ensure better and improved patient health outcomes. This expertise is applied through science and research, through educating the next generation, and through transforming patient needs into services. The theme of World Pharmacists Day emphasises that pharmacists are a trusted source of knowledge and advice, not only for patients but for other healthcare professionals. For every patient who walks into a pharmacy, pharmacists ensure that the right medicine is provided at the right dose and in the most suitable formulation. FIP encourages pharmacists to use this day to organise activities that promote and advocate for the role of the pharmacist in improving health in every corner of the world.